Valencia is a vibrant, cosmopolitan city on the Mediterranean coast and the capital of the autonomous community of Valencia, which is able to harmoniously combine the remnants of its farthest past, dating to the year 138 BC, with the most innovative and avant-garde buildings from the new millennium. Valencia is the third largest city in Spain after Madrid and Barcelona, with around 800,000 inhabitants in the administrative center. Its urban area extends beyond the administrative city limits with a population of around 1.5 million people. The Valencia airport is situated 8 km west of the city, in the city limits of Manises. There are a frequent bus-service from the terminal to the city center, metro line and taxi-service. It takes approximately 20 minutes by car to the SH Valencia Palace Hotel, where the meeting will take place. The price is: €2,50 in one direction. By metro: You can take the Metro No. 3 and 5 from the metro station Aeroport to the city center (station Xativia). The metro station Aragón (metro No. 5) is located within 9 minutes walking distance from the meeting venue. The metro operation hours are Monday-Saturday from 05:30-23:00. Saturday-Sunday and on Public Holidays from 06:00-23:30. Taxi stand at the airport are opposite the arrival halls. An average journey by taxi from the Valencia Airport to the city center takes about 13-18 minutes and costs approx. €18,00-€20,00 one-way. Phone numbers of main taxi companies: 0034 96 370 33 33, 0034 607 181 181, 0034 96 374 02 02.. The banks in Valencia are open from Monday to Friday between 8:30 a.m. and 2:30 p.m. Only a few branches open on Saturday mornings. There are 24-hour automatic tellers around the city, and most of them offer international services. Credit cards such as American Express, VISA, Mastercard, 4B, Access y Diners Club will be accepted by most hotels, restaurants and shops in Valencia. An ATM (Automatic Teller Machine) is located in front of the meting venue. Although Valencia (like the rest of Spain) is basically catholic, all religions are allowed and practiced by many citizens. Please contact your hotel concierge for current times of services or nearby churches. There is no city tax in Valencia. The official currency in Spain is Euro (€). You can exchange your currency in all banks as well as in one of the many exchange offices in Valencia. When you are exchanging your currency, you need your passport or official ID card. If you do not have it with you, the bank may refuse to exchange your currency. Standard electrical voltage in Valencia is 220-240 V AC, 50 Hz. Most electric outlets adhere to the continental standard (Schuko). Appliances from North America require a transformer and British ones an adaptor for the two-pin sockets in use in Spain. Adapters are available in most hardware stores. There are different museums in Valencia. For prices and opening hours please refer to the hotel reception or any tourist information. Some museums and exhibitions are closed on Mondays. To move around the city, Valencia offers a wide range of public transport, including metro (www.metrovalencia.es), bus (www.emtvalencia.es), tram and a bicycle service Valenbisi (www.valenbisi.es/). 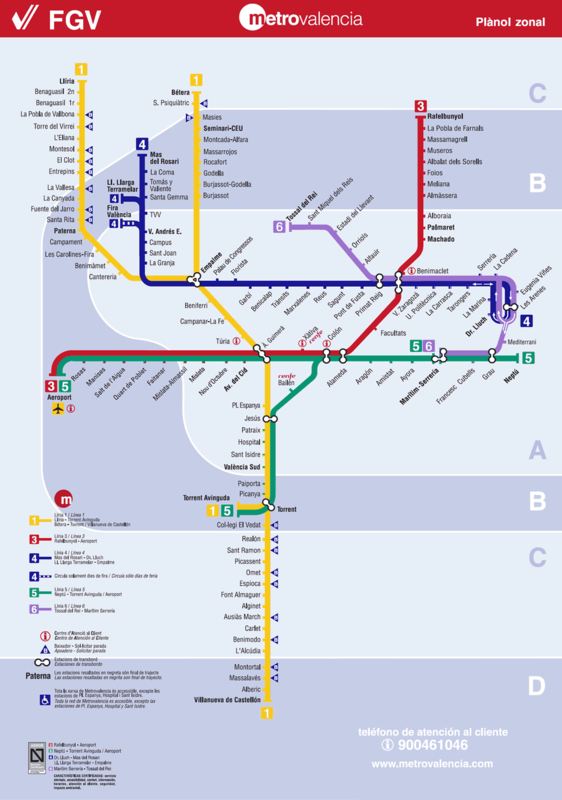 Moving by metro is a good option in Valencia. The city is widely covered by five metro lines that run from 5:30 a.m. to 12:00 p.m. You can check metro stops, timetable and fees on this link. The city buses (EMT) have a wide network all over the city. The bus services in Valencia start at 4 am on some of the lines, and end at 10.30 pm. Then follows the night bus service, which ends at 2 am, except for on Fridays, Saturdays and the nights before public holidays, when it continues until 3:30 am. You can consult and plan your trip within the city, from a starting point to your destination, on the EMT website. The good weather contributes to sit at the terraces of the coffee-shops, bars and restaurants which are opened until very late. Valencia is a city where you can enjoy the nightlife to the full. There are a whole host of places where you can sample the lively atmosphere: from the various bars, pubs and discos to the numerous clubs, for example the nightlife hotspot La Malvarrosa beach and the promenade. The restaurants normally open for lunch from 13:00 to 17:00 and for dinner from 20:00 to 23:00. Cafes and breakfast bars may open already at 08.00 or even earlier. There is a great number of “Tapas-bars” where you can enjoy a drink and small “tapa” or “pincho” to eat while you wait for the restaurants to open. Their opening hours usually are from 10:00-23:00. Bars, night clubs and discotheques usually open from 22:00 – 04:00 (some even longer). As in each tourist hotspot – we recommend carrying your wallets in closed/zipped bags and keeping an eye on your bag when standing/walking in crowded areas, packed metro stations or buses, etc. Do not carry all cash money, credit card and ID documents all together in one bag/pocket. Don’t put phones, cameras etc. on tables at cafés and keep your belongings always on your lap. Be wary of strangers approaching or touching you and do not play any street games. Whatever your likes and dislikes, in Valencia you are bound to find what you are looking for. Shops are generally open from 10.00 to 13.30 and from 16.30 to 20.00 hours, Mondays through Saturdays. Department stores and malls usually open from 10.00 to 21.30 and do not close for lunch. Sales: the winter sales generally begin in the second week of January and go on until the end of February, and the summer sales begin on 1 July and run until the end of August. VAT is always included in the price presented to the customers/guests in shops, hotels, restaurants and other service providers. Non-EU citizens can directly claim back their VAT at the shops (excluding restaurants, hotels and other food) when the total bill exceeds 90.15 €. Please ask at the shops for more information. A service charge is not always automatically included in hotel and restaurant bills, it will be stated on the bill or in the menu. Tipping is not mandatory, but a small gratuity (5-10%) is expected in restaurants if good service is received. There are many taxi companies in Valencia and taxis are easy to find. The taxis in Valencia are white and with a green illuminated light on the top of the taxi which indicates if it is available for hire. To hail a taxi all you only need to do is to raise your hand. Valencia is located in the Central European Time Zone (CET), i.e. one hour ahead of Greenwich Mean Time (GMT+1). All foreign visitors entering Spain must possess valid passports. For citizen from the European Union Member countries, a valid identity card is sufficient. PLEASE CHECK THE CURRENT VISA REQUIREMENTS WITH THE NEAREST SPANISH CONSULATE/EMBASSY IN YOUR COUNTRY BEFORE YOUR DEPARTURE TO SPAIN!